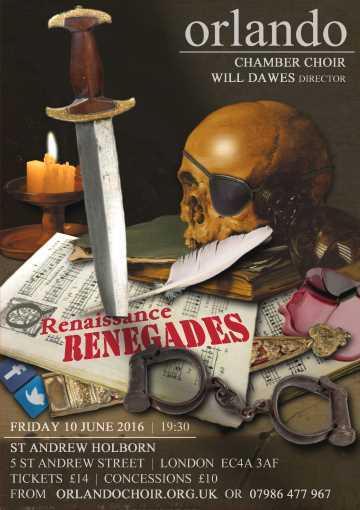 Orlando Chamber Choir presents a dangerously exciting concert with music by Renaissance renegades – brilliant composers like Weelkes, Guerrero, Gombert and Gesualdo who, through fate, fault or fortune, all ended up on the wrong side of the law. They transcribed their experiences of drunkenness, debt, imprisonment, robbery, indecency and murder into musical compositions, using expressive counterpoint and unconventional rhythms, dramatic dissonance and tormented chromatic progressions - sometimes even set to the composer’s own moving poetry. For your and our safety the concert takes place at a stone’s throw from the Old Bailey.